Hero Honda is a legacy undertaking now and is almost in it's last leg before it metamorphoses into, well let's hope something new and better. In it's years of being the leading motorcycle manufacturer, not only in India but also world wide, the primary target of the company has been running on a single track. Focus, more focus and when you are tiered of focusing, then start all over again focusing on the commuter class, and boy have they been successful in doing that or what!! As the company's profit and market share grew, the R&D of Hero Honda just got enough air to develop into a bare bone, which was only capable of generating more stickers and graphics than anyone else. No engine development what so ever. So, continuing on their legacy, the company's first release of the year is the 2011 Hero Honda Karizma, Hero Honda's only premium bike gets fresh bare essentials. 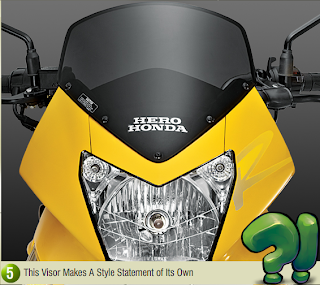 Now the big question is, what's so new about the 2011 Karizma?? That's a very good question actually :) So, let's see what Hero Honda offers us as "New" and what does it mean for us. Now that's pretty disgusting actually to me. I mean in all my imagination, I cannot find one thing that's exciting about this graphics. If somebody asks me then I would say that the graphics of the first gen Karizmas were way more appropriate and exciting than this supposedly more contemporary styling. The only things which are a bit pleasing are the black gas cap and the copper colors front shocks. I mean just look at the rear shocks... why would anybody think of having them red? Simply defies my logic!! Nothing annoys me more than a lame work on the engine being termed as NEW!! What does ASFS mean? 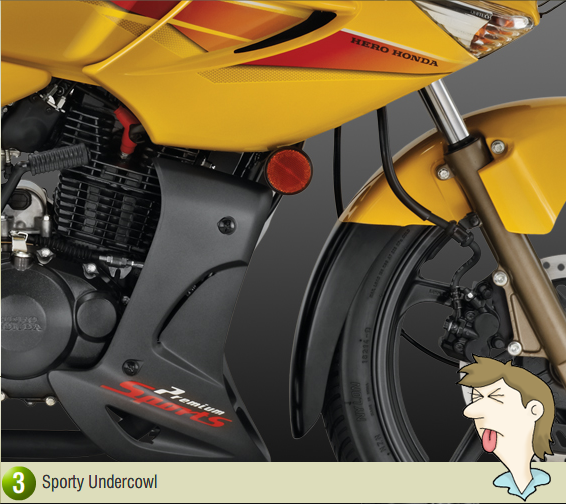 Simply put it's Advanced Swirl Flow induction System, something what Bajaj did with it's DTS-Si engine. 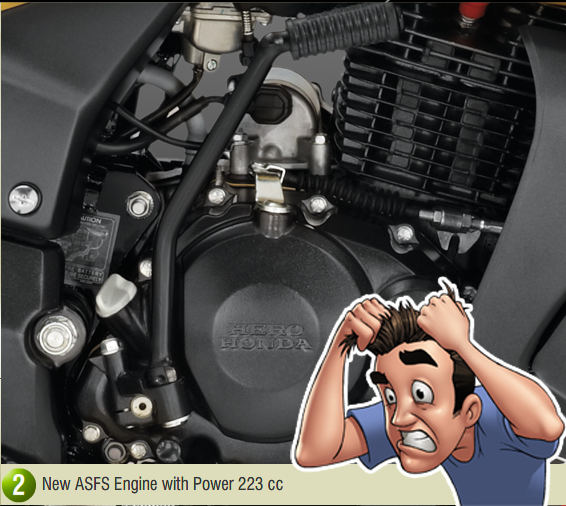 There's no doubt that the Karizma engine is one of the most potent engine in it's class, when you bring reliability into picture. All it lacks is a bit of bite. A 223 cc motor generating 17 PS of peak power at 7K rpms is definitely an underplay in contemporary times. AAAH!! Now you have a sporty under cowl, which has no purpose what so ever and on top of an oddly placed reflector. The reflector would have made much more sense if it would have been somewhere around the front fender as it would have reflected to the oncoming traffic with the movement of the front end. But at it's current position, well I better not speak. Inclusion of the clear case front indicators is good though!! Nothing new about it. Inclusion of steel braided hose would have definitely been a welcome change, but who cares to think.... I'm just interested in providing my customers graphics. I mean seriously WTF?? What am I looking here that would make a style statement of it's own? If any of you guys can see anything like then please do let me know... I would love to see and appreciate it, but for now... I see nothing except a black tanned visor and that's it. So, how does that make a style statement of it's own?? 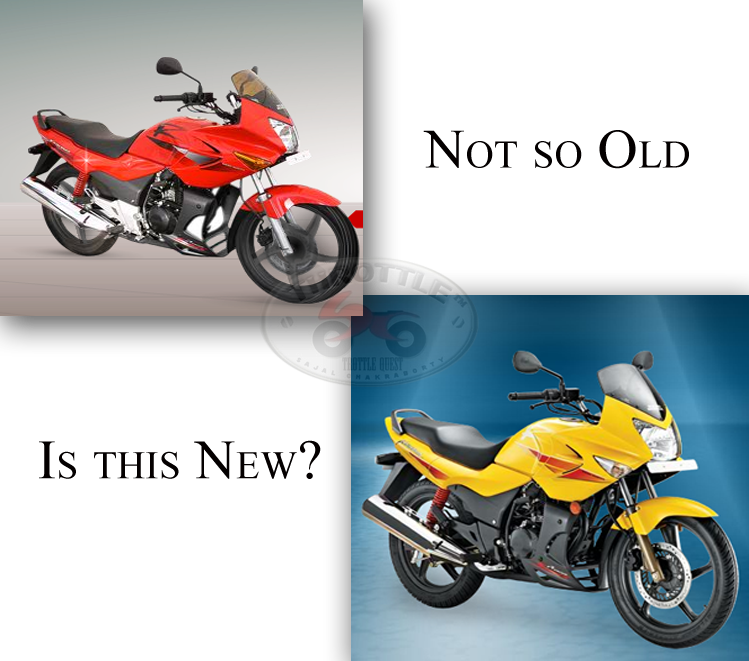 Karizma belongs to one of the most explosive segment of motorcycles in India. The premium segment of motorcycles are seeing a complete metamorphosis off late and with tactics like these, it would be completely Hero Honda's fault if this wonderful bike lags behind. Hero Honda has been fortunate enough to get such a wonderful engine from Honda, but it seems that the Indian leg is not intelligent enough to keep this amazing legacy going. 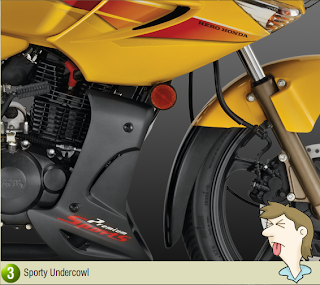 Sadly but from ThrottleQuest's point of view, the 2011 Hero Honda Karizma is a complete bummer. Karizma is most proportionate bike.It does not want any graphics.The only thing this bike wants is rear disc brake. 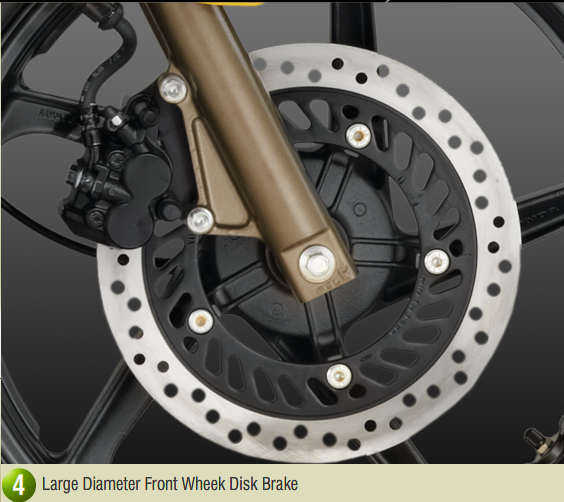 The 150 cc hunk has got rear disc, gas (GRS) shocks. I dont know how to shoot the designers. Fed of this sticky sticker job. 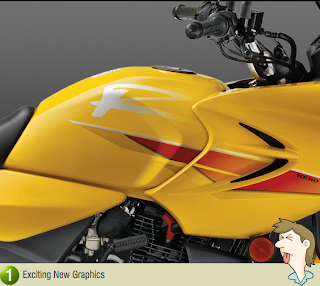 Karizma is most proportionate bike.It does not want any graphics." and that's exactly why I like the first gen Karizmas from the graphics point of view. At least that's the feedback I've got about the bike.